With all this hype about ketogenic diets, you may find yourself asking, what exactly is a ketogenic diet? And why are so many people on to it? Is it even good? Is it one of those new diet fads? (At least that's the question we get a lot now at COCOLAB). Simply put, a ketogenic diet focuses on literally saying goodbye to carbohydrates in your diet and giving a big high five (and a warm hug) to Good Fats and Protein. That's right! You E-L-I-M-I-N-A-T-E carbohydrates and you ADD FAT! Now now, we can hear you saying "but I'll need carbohydrates for energy" already. Turns out, a good fat is a better and healthier alternative energy source than carbs. The energy source, ketones for this case, is that better alternative. When consuming good fats such as our Classic Virgin Coconut Oil, or better yet, purer MCT sources such as the COCOLAB MCT Oil or MCT Energy Booster Powder, the body goes through a process called "ketogenesis", breaking down fatty acids into ketone bodies. This process is metabolized much faster in our body. Carbohydrates take a longer time to be broken down to glucose, the energy form we are more accustomed to hearing. It is no wonder why ketone is often associated as lightning speed energy. A ketogenic or keto diet teaches the body to use fat (converted to ketones) as a fuel source instead of the traditional, and most of the time weight-gaining, carbohydrate (converted to glucose). But what are the benefits of having ketones in your body? There are plenty, and good ones too. In fact, you would be practising self-love a lot more by giving your body ketones. 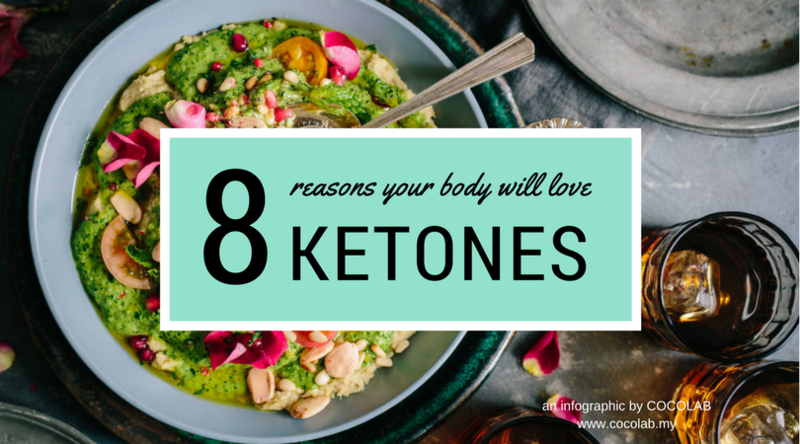 Here are the 8 Reasons Your Body Will Love Ketones. Ketones are a form of ready-for-use energy. That means your body will definitely experience a boost in energy levels for your daily activities. These ketones do not just rest there. They will also begin to burn fat down and increase the body's metabolism. Weight management in the longer term is a lot more viable with ketones in the system. Almost all modern food production use chemicals to manufacture foods or what we call processed foods. These processed carbs and refined sugars give the body a spike in glucose levels. Medical studies have shown that cancer cells are able to metabolize glucose into energy. This feeds the cells to grow and multiply. However, studies have also shown that ketones do not feed these cancer cells. Therefore, a High Fat, Low Carb diet will starve cancer cells, protecting our body against cancer. Alzheimer's is essentially a diabetes of the brain as the brain develops an insulin resistance. This insulin resistance in the brain prevents glucose from being broken down into energy. As a result, brain cells do not function or connect as well as they should. Excess, non-metabolized glucose in the brain can also cause oxidative stress or damage in the brain. That and the lack of energy in brain cells cause those cells to die prematurely. Fortunately, ketones are small enough to be used by the brain as an alternative and stable fuel source. In a ketogenic diet, the reduced carbohydrate intake will lead to a drop in blood glucose. This allows insulin levels to drop to healthier levels. What’s so important about having low sugar or insulin levels? Medical studies have shown that high levels of sugar or insulin leads to an increase in cancer, diabetes and heart diseases. Obesity is also connected to high levels of these components. Ketogenic diet have been popularly introduced to those who are on a weight management programme due to ketones promoting a better control over our hormones. Ketones have a direct effect on ghrelin, the “hunger hormone” and leptin & amylin, the “satiety hormones”. With ketone intake in ketogenic diets, “hunger hormone” levels fall. Therefore, you are less hungry. This is very different to other mainstream diets which causes the “hunger hormone” to increase significantly. During ketogenesis, the “satiety hormone” levels increase. This causes you to feel “full” for a longer period of time instead of constantly feeling hungry. Ketones therefore help to better manage your food intake during periods of dieting. In obese individuals, there are HIGH levels of (1) triglyceride, (2) insulin, (3) LDL – low density lipoprotein, but LOW levels of HDL – high density lipoprotein. To maintain a healthy body, individuals should have HIGHER levels of HDL and LOWER levels of (1) triglyceride, (2) insulin, (3) LDL. Including ketones in your diet can help you achieve that by increasing HDL and reducing triglycerides, insulin and LDL. This will better protect your heart against cardiovascular diseases. Diets with ketones give individuals better mental clarity, less tendencies of mood swings, irritability and depression. In ketogenic diets, intracellular sodium concentration falls. This mimics what drug mood stabilizers do to your body. Only with ketones, you factor out these synthetic drugs. Ketones help you achieve a better state of mind naturally. Ketones have a protective effect on mitochondria in our body cells. Mitochondria are responsible for (1) breaking down carbs AND fat into energy known as Adenosine triphosphate, ATP. They also (2) control cell death and growth whereby uncontrolled cell growth is similar to a cancer growth. Finally, mitochondria will (3) balance the number of cells in the body. It is worth pointing out that mitochondria also PREFER to use fat for energy instead of carbohydrates, as fat is easier to process and to break down. How are ketones important here? First (1) they stimulate mitochondria respiration & function, allowing them to keep at optimum. Ketones (2) have an antioxidant effect which reduces oxidative stress. This reduces cell dysfuntion and eventually diseases that stem from the cell level. (3) Longevity of each cell is therefore increased. Ketones help cells achieve better function and lifespan. This in turn reduces the risks of modern diseases and promotes longevity of life. There you have it. These list of benefits are a great reason to include ketones into your diet, if not for specific reasons, but for general health purposes. The best sources of ketones are from whole foods containing Medium Chain Triglycerides like what is available here in COCOLAB. COCOLAB's MCT Energy Booster Powder and MCT Oil is a great place to start. They are easily added into your everyday food or drink intake and consistent intake will most definitely produce immediate results! Browse our shop online at www.cocolab.my or a physical store near you for a ketone solution of your choice today!